Cassette system was designed specifically for installing blinds on the plastic (or other kind of) windows. The fabric shaft is hidden inside the box and guides are located on the sides of it to protect the fabric from mechanical damage and to make the fabric stay as much as possible parallel to the glass when opened in the flip position, without letting it sag. Day and Night is two-layers striped roller blinds. One layer is moving parallel to another. Every layer is an alternating of dense and transparent stripes. Pleasant looks and high functionality will make you choose Zebra curtains. Just like regular roller curtains, Zebra can be lifted all the way up to the box or leave at the necessary height where it is fixed by itself and does not get lowered by its weight until you pull the control chain. You can place a chain either on the left or the right side of the curtain. 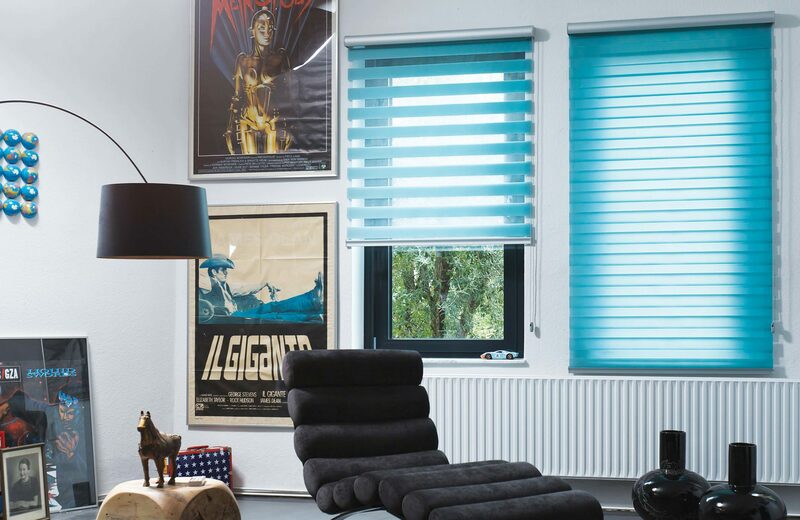 Besides the regular functions of the roller blind (moving the fabric up and down), Zebra allows to change the level of the light and direct sunlight passage by the overlapping of the stripes from two layers at different angles. • If the fabric is lowered and dense fabric strips are overlapped, the light goes through transparent strips. • If the fabric is lowered and dense fabric stripes are not overlapped, darkening occurs. • Stripes of two layers can be partially overlapped when the direct light goes from below, when the sun is completely dissipated from above. • Fabric can also be lifted in the box. The blind is equipped with a certain system to the customer’s choice. 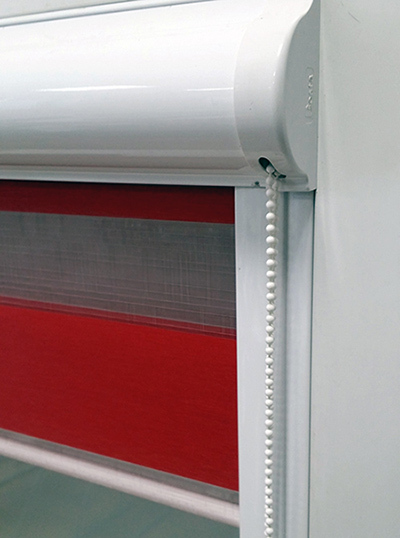 Specially designed cassette systems of roller blinds “Day and Night” for the plastic windows. The shaft is hidden in the box. When you open the wing in a flip position, the fabric does not sag and remains along the glass thanks to its C-shaped guides, installed with a double-sided adhesive tape on the sides of the beads. The cassette system box can be mounted on a plastic window either on a double-sided adhesive tape or screwed with self-tapping screws, which will not be visible after the installation (they are hidden by side plugs). Fabric composition: 100% polyester. It is more convenient and easier to determine the type of equipment when you are near the window on which you plan to install curtains.